We can use up to 4 robotic PTZ HD cameras set up in our meeting venue. These cameras are unmanned and controlled remotely for fewer distractions. We can connect to provided high-speed internet (10mbps up and 10mbps down) or we can furnish our own 4G mobile broadband service if there is an adequate 4G signal on site. Have the entire Live Stream recorded on HD video for your archiving or upload it for later viewing. Stream for free to your website, YouTube or Facebook page. Let us tap into your meeting’s main audio soundboard or we can provide wireless mics on site. Connect your PowerPoint or laptop computer for Picture in Picture or Full-Screen presentations. Teleconference with one other remote site via Skype. We can route the Skype signal into the Webcast via PIP. 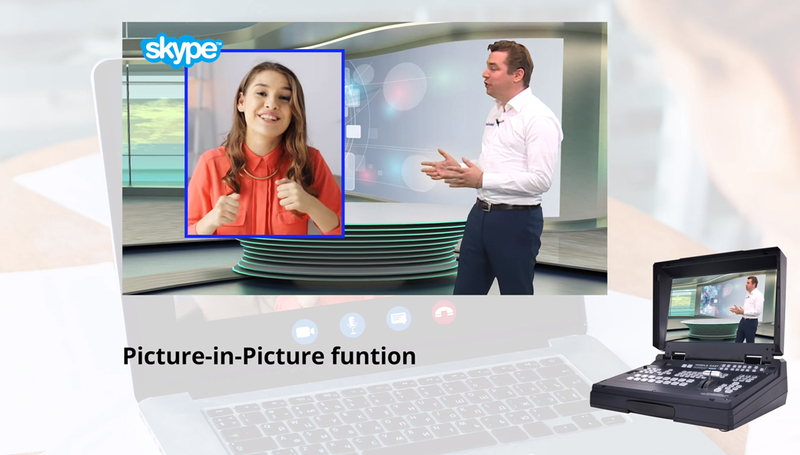 If you do not have a Skype account, your remote party can ring in on our account. We’ll sort out the logistics ahead of time. With any webcast or live stream, you going to have a delay in the video. We call this latency. It is just a fact of life when it comes to webcasting. Depending on the bandwidth, the stream settings, resolution and the device your viewers are on, latency can range anywhere from 4 seconds to 35 seconds worst-case scenario. Technically it is not actually “Live”, there is always a latency (delay) with webcasting no matter who it is streaming your event but that is very standard in the webcasting business. The latency varies on the quality output of the stream. We do have audio delay tools to offset any unforeseen lip sync issues (So far it has not been an issue with our tests). We always try to optimize a low latency live stream for you especially if you want to interact with your viewers. With our set up, the best latency we have gotten is around the 6-second mark which isn’t terrible. Not to get too technical, but there are settings on YouTube that can be adjusted to optimize latency. For example, and ultra-low latency setting will cause a slight decrease in picture quality because it is processing the video stream at a much faster rate. A low latency speed will get you a great video quality stream. If you are setting up the Live Stream on your own CDN (Content Delivery Network) such as Facebook or YouTube, you can adjust these settings on your own and supply us with the RTMP URL code and stream key. We can assist you or your IT personnel with that if need be. If you would like us to stream to one of our CDN accounts, we can do that too and then distribute you the link to the live stream where you can then forward on to your audience and viewers. Remember too, if you just want us to video record your meeting, we can do that. We do get requests to just record a conference, or deposition, meeting and other presentations without having to necessarily LIve Stream it. We’ll be glad to do that and deliver you a master copy of the even via Dropbox or USB thumb drive. We can insert logo bugs or lower thirds onto your image if desired. However, if you want to place your Live Stream feed onto your website or company web page that can be arranged as well. Again, we can stream directly to your own CDN or we can provide the CDN for you on our account and send you or your IT person an embedded code where you can simply copy and paste it into your editor on your web page so you can get a Live stream LIVE on your website. Please call us for more details.